On the left, four ground-view camera images taken from the moon’s simulated surface are reprocessed as a top-down aerial reprojection view of the lunar landscape. 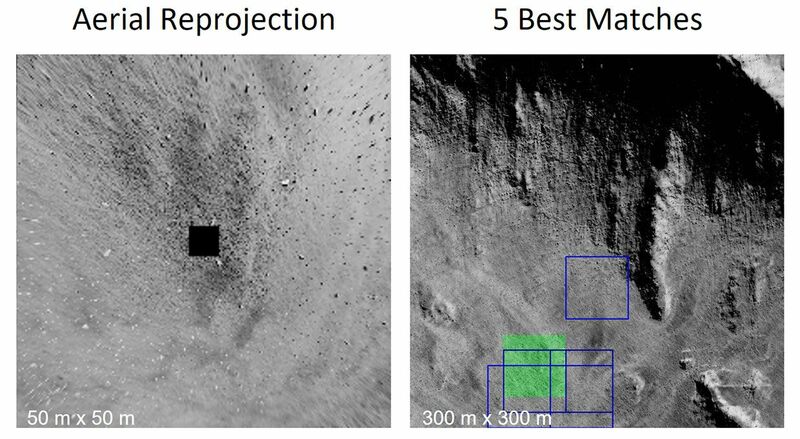 On the right, a deep-learning algorithm uses moon satellite maps to come up with the five best candidate locations matching the aerial reprojection view. A Mars rover roaming the Red Planet cannot whip out a smartphone to check its location based on GPS. Instead, the robotic explorer must take panoramic pictures of the surrounding landscape so that a human back on Earth can painstakingly compare the ground images with Mars satellite maps taken from above by orbiting spacecraft. Locating a Mars mission after it first touches down, using that manual process of scrutinizing landscape features and making image comparisons, can take up to 24 hours. What’s more, it still requires at least 30 minutes to confirm a rover’s updated location after it’s on the move. But a new AI approach that trains deep-learning algorithms to perform the necessary image comparisons could reduce the localization process to mere seconds. A team of space scientists and computer scientists gathered together during the 2018 NASA Frontier Development Lab event to develop that potential path forward for future space missions. “If we go to more planets or another moon or the asteroids, the goal is to be able to use this to localize ourselves in GPS-free environments,” says Benjamin Wu, an astrophysicist at the National Astronomical Observatory of Japan and a member of the team that tackled this challenge.